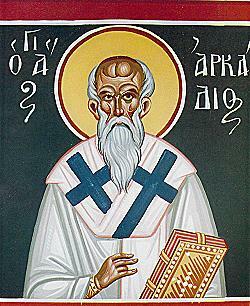 Saint Arkadios was a great Hierarch of Arsinoe (today's Polis Chrysochous) in Cyprus, a brilliant luminary to the Christians of Paphos, and the brother of Saint Theosebios of Arsinoe (Oct. 12). He was born in the village of Melandra in Paphos and his parents were named Michael and Anna. These two Saints and brothers according to the flesh seem to have lived between the late fourth and early fifth centuries. In other words, they probably lived during the time of Saint John Chrysostom and Saint Epiphanius, Archbishop of Cyprus. At a young age, Arkadios went to the queen of all cities, Constantinople, where he acquired the higher education that he so desired. While there, with its secular attractions and a number of temptations, he managed to remain the same way as he was in his homeland; pure and wise, temperate and a faithful follower of Christian teaching. When he returned to Cyprus, his love and desire for the ascetic way of life led him to often leave his home and to hide "in the mountains and the caves and the holes of the earth," as is stated by Saint Neophytos the Recluse in an encomium he wrote about Arkadios. His fame reached Nikon the Great, the then Bishop of Arsinoe, who asked to see him. And after having learned about his way of thinking and his sanctity of life, he pressured him to agree to become a priest in order to be able to offer more services to the people of God. With the grace of the priesthood that he received from the hands of Nikon, he put as his aim to reach the highest peaks of virtue. Struggling night and day, he went so far as to drive away, with the grace of God, demons from people, to be able to cure sicknesses, and have the gift to predict future events. It was therefore no surprise that immediately after Nikon's death, everybody looked towards him for the throne of Arsinoe. Thus, the people unified in one voice, elected Arkadios as being truly worthy of the Bishop's Throne of Arsinoe. Arkadios did not want to leave his beloved ascetic life and his "God-learning serenity", but the vote of God won over, and he was ordained Bishop. From the throne of Hierarchy, Arkadios turned his attention to the protection of his flock from heresy. During that time heretics and the heretical beliefs of the Arians, Pneumatomachs, Gnostics and others, had reached Cyprus. And the new Bishop made it his duty to make a substantial effort to educate the people, that the Orthodox faith is the signpost that leads to salvation. And Arkadios took care so that this signpost was properly placed. Therefore, as an enlightened pastor, he was preaching until his last breath, the true teaching of Christianity. Saint Neophytos also informs us that Bishop Arkadios would often ascend a neighboring mountain where he had previously lived his ascetic life and even as Bishop would go there to pray with tears, fast and keep vigil. At a ripe old age, he surrendered his soul to the hands of God on the 29th of August, the date on which the memory of the Beheading of John the Forerunner is celebrated. Saint Arkadios did many miracles while he was alive, but also after his death. In the forest of Paphos near the village of Kinousa, and about two kilometers north of the "Saint Merkourios" site, the ruins of the ancient Monastery of Saint Arkadios can be found. This Monastery was built during the fifth century, probably by Saint Arkadios or by others after his death, perhaps in the place where the Saint previously lived as a hermit. Saint Neophytos says this Monastery was still in operation in the twelfth century, but today it is ruins. Shrines dedicated to Saint Arkadios once also existed in the villages of Kathikas and Giolou. As a shepherd most sacred, of Arsinoe you were perceived, you made Cyprus bright, by the light of your virtue, all-blessed Arkadios. Wherefore by the Lord, you were deservedly glorified, showing yourself to be a companion, of all the saints, together with whom do not cease to intercede, on behalf of our souls.